Whether on a formal occasion or simply for a dinner with friends or family, the round table affords a host of considerable advantages which make this piece of furniture a true ally for sociability. Its shape makes ‘democratized’ conversation possible among all diners, while the absence of any sharp corners and edges almost always means a last-minute guest can be added. Equity and equilibrium are the ‘manifestos’ of this object which, thanks to its shape and ‘egalitarian’ philosophy, brings together guests while making their interaction more informal. 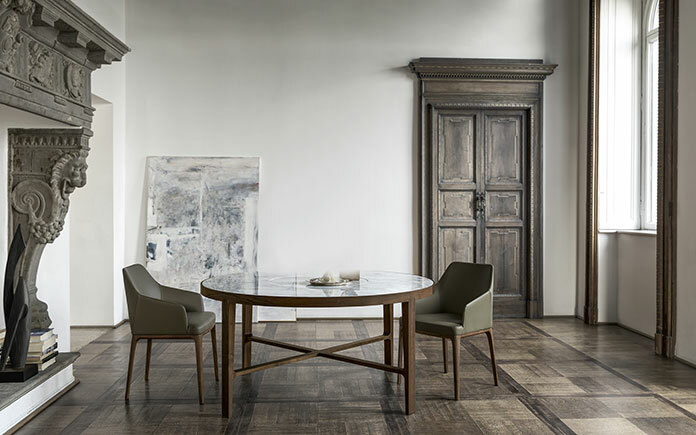 The ‘round table’ for Alivar is a merger of fine materials and extremely clean-cut shapes, which are details that distinguish the entire Home Project collection that includes both Globe and Liuto. A novelty presented at Salone del Mobile 2017, Globe incorporates Italian cabinet-making tradition through the use of wood, which is implemented in the frame, that warms and embraces the natural beauty of marble making up the table top. This item of furniture turns into a genuine sculpture, thanks to the inlays and perfect jointing that embellishes your dining room with sober elegance. Globe is all the more functional thanks to the Oriental-style revolving tray, placed in the center of the table top, allowing diners to ‘reach’ all the dishes served with the utmost ease. 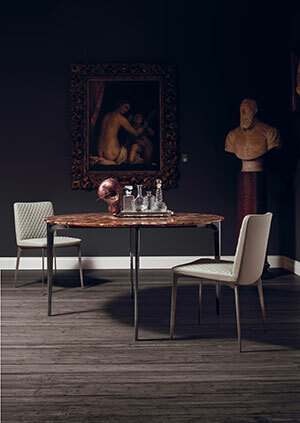 Refined workmanship and exclusive details can also be found in the Liuto table, a piece of furniture with slim and minimal silhouettes that enhances the value of your dining room with a discrete and far from ‘cumbersome’ charm. The absolute starring role in this table is played by the table top, which is distinguished by the deep burnished color of fine Emperador marble, for a solution that gives rise to the just compromise between contemporary style and craftsmanship flair. The Liuto table top is also available in the smoked glass, matt lacquered MDF, wood finish or marble versions.